You can customize how APIs are displayed in the API Catalog view of API Portal, and you can customize what actions your API consumers can perform on APIs. Display APIs in a list or tile view. Show or hide the button that enables users to download API definitions. The default is shown. Show or hide the button that enables users to download client SDKs. The default is hidden. Hide APIs associated with specified tags. Show only APIs associated with specified tags. For more details on tags, see Group APIs with tags. Show or hide the button that enables users to try out an API. You can show the button for all users, for authenticated users only, or hide it completely. The default is shown for all users. 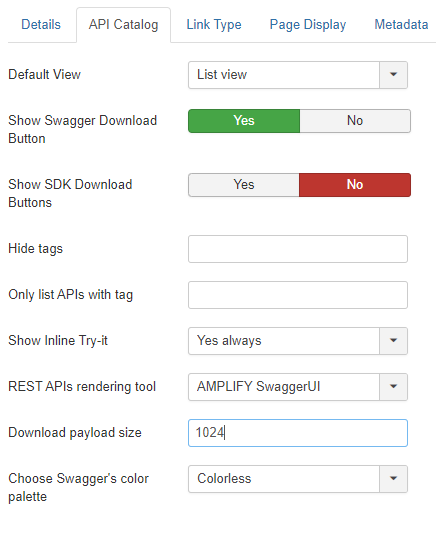 Display REST API details using the Swagger.io or AMPLIFY Swagger UI rendering tools. The default is AMPLIFY. SOAP APIs are always displayed using Swagger.io. Display REST API details using a colorful or colorless scheme when using the AMPLIFY rendering tool. You can also change the method colors when using the colorful scheme. Click Menus > Main Menu. Click the API Catalog tab.